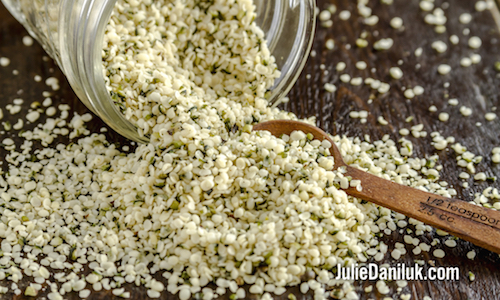 My passion for Hemp Hearts (shelled hemp seeds) started 12 years ago when Mike Fata shared his astonishing 120-pound weight loss transformation with me. How? By eating a diet high in hemp. From his success story, I was motivated to see how hemp could help my nutrition clients meet their health goals. One taste of these little green and white gems and I was hooked. There are many seeds that boast superfood status, though few taste this fantastic! Hemp Hearts are nutty and sweet, like pine nuts, yet sport good amounts of Omega-3 fatty acids. Flax seed and Chia seed share the Omega-3 benefit, except when they get wet, their mucilage fibre gets slippery or sticky. Hemp’s crunchy, yet creamy, texture makes it the most versatile vegan Omega-3 source. Try it in soups to add creaminess (instead of dairy). Its high protein content makes it a perfect addition to meal replacement bars, cereal, porridge, salads, pesto, pasta, dressings, sauces, smoothies, desserts and side dishes. Hemp seeds contain both essential fatty acids necessary for muscle and joint repair. They also have ALL the essential amino acids, in an easily digestible form. As studies suggest, a predominantly plant-based diet is the starting point for a strong anti-cancer approach to eating; Hemp Hearts can be your delicious gateway. 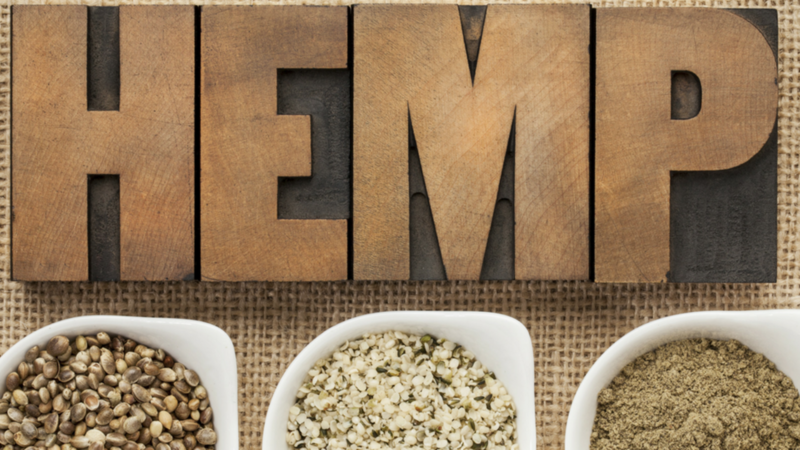 If you've ever thought it might be a challenge to get enough protein when following a vegetarian diet, Hemp Hearts are a terrific solution. Your body takes amino acids from your diet and reassembles them into proteins that are used for all sorts of different functions in your body – from building muscles to healing injuries and fighting infections. Two tablespoons (30g) of Hemp Hearts contains 7 grams of protein - equivalent to a large boiled egg. What’s more, 65% of the total protein content of hemp seed comes from an easily digestible protein, called edestin, which is readily absorbed and utilized by the human body. Edestin has the unique ability to stimulate the manufacture of antibodies against foreign invaders, boosting your immune system. It is also hypoallergenic, meaning it has low allergy potential, making it a great replacement for soy and peanuts (provided it is processed in a factory free of tree nuts, such as Manitoba Harvest Hemp Foods). 1. Hemp Hearts help fight inflammation. Hemp seeds contain an especially beneficial type of Omega-6 fat called GLA (gamma linolenic acid).1 GLA is a direct building block of PGE1, a type of prostaglandin that works in your body as an anti-inflammatory massager. GLA can decrease inflammation, helping asthma, arthritis and muscle pain. GLA also supports healthy hair, nails and skin. 2. Hemp Hearts help heart health. Hemp Hearts sure live up to their name! The fatty acids in hemp help lower bad LDL cholesterol and improve cholesterol ratio.2 Hemp Hearts are rich in phytonutrients and anti-aging antioxidants, such as Vitamin E, that protect your cardiovascular system from damage. 3. Hemp Hearts help reduce muscle cramps. 4. Hemp Hearts help balance hormones. Many women use Hemp Hearts to help with hormonal imbalances caused by menopausal symptoms, including hot flashes and depression.5 It is also helpful for PMS symptoms due to its GLA and magnesium content. Hemp Hearts blended with blueberries make a great breakfast smoothie. 5. Hemp Hearts help improve immunity. Kapoor, Rakesh; Huang, Yung-Sheng. "Gamma Linolenic Acid: An Antiinflammatory Omega-6 Fatty Acid." Current Pharmaceutical Biotechnology, Volume 7, Number 6, December 2006, pp. 531-534(4). Gerry Schwalfenberg: "Omega-3 fatty acids: their beneficial role in cardiovascular health." Canadian Family Physician June 2006 vol. 52 no. 6 734-740. Michelle A. Micallef, Manohar L. Garg "Anti-inflammatory and cardioprotective effects of n-3 polyunsaturated fatty acids and plant sterols in hyperlipidemic individuals." June 2009 Volume 204, Issue 2, Pages 476–482.